I may not have shared any cooking on the blog recently, but that doesn’t mean I haven’t been cooking! It’s was just so busy with school and work, that even though I took lots of food pics, they just didn’t seem to make it to the blog. Now that I have a break, I plan to get these all to you. The first recipes in the archives use the wonderful French Lentils, previously recommended by Sam. 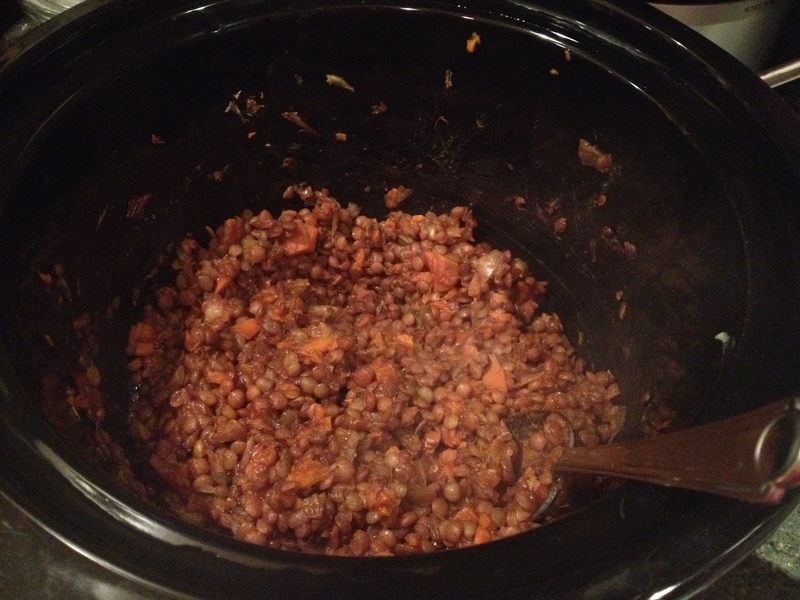 I really love lentils. They cook up rather quickly and pack a load of protein and fiber. I have been buying my lentils in unusual places, like those discount department stores! There is one such store right next to my local grocery store, and I am often drawn to browse there after I’ve gotten the grocery shopping done. I always take a quick look at the “specialty” food shelf and am sometimes pleasantly surprised at what I find there. 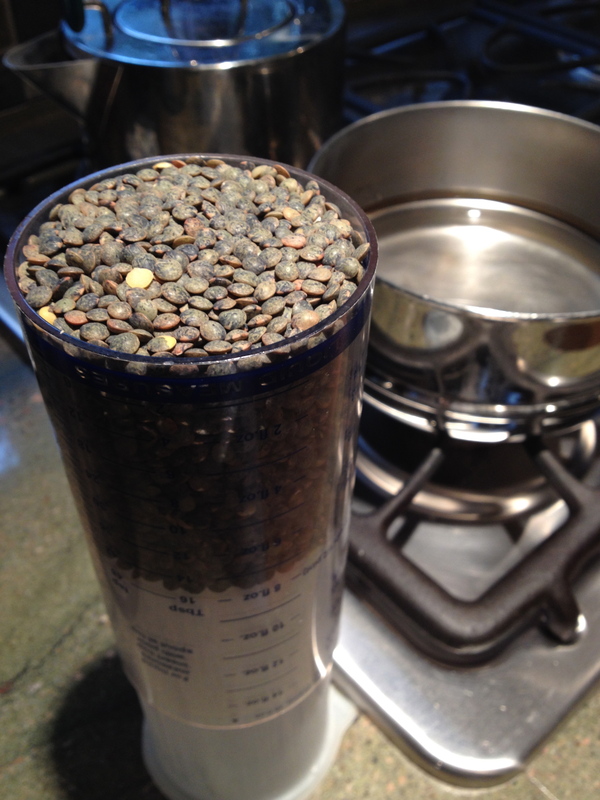 This is where these lentils came from, as well as my stock of chia seeds. Chia seeds can be quite expensive and I just love a deal! Place all these ingredients into the crockpot. 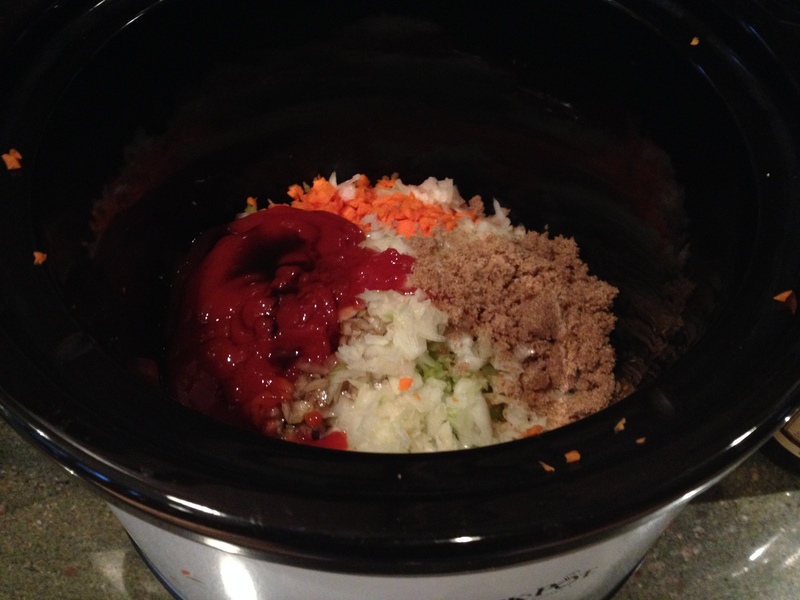 Turn the crockpot to low, if you are leaving it for the day, or on high if you didn’t plan ahead and need it in 4 hrs. Take one guess which I did! Here are the ingredients in the pot. I think they look pretty to begin with. You can always add more veggies. I think peppers would be nice addition. 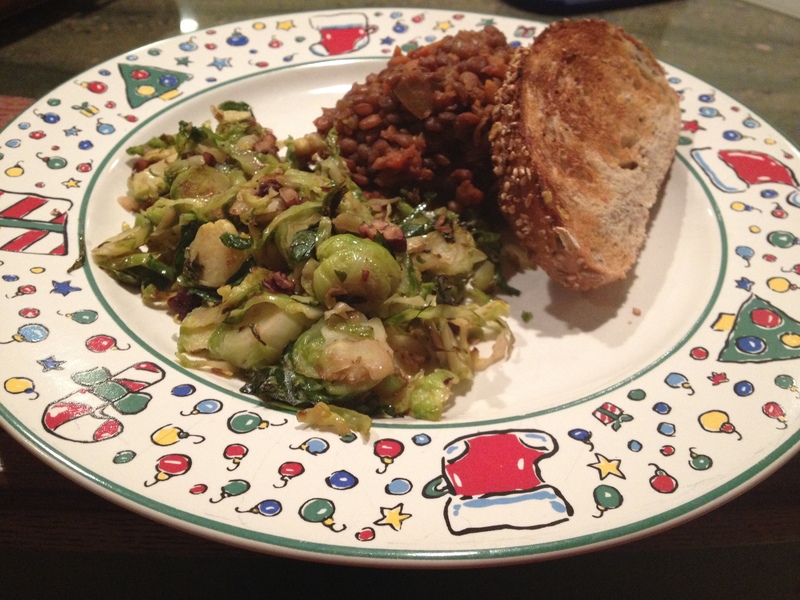 While the Sloppy Joes are finishing up, start the Brussels Sprouts. Now, I know brussels sprouts have a reputation for being bitter but if you buy fresh, and don’t overcook them, you will experience them in a whole new way. My brother was visiting and I fixed brussels sprouts for dinner. He remembered the brussels sprouts from when we were kids and we ate a lot of canned and frozen vegetables. We hated brussels sprouts! I urged him to give these a try and he was amazed at how tasty they were. So, I urge you to try these also. So peruse your produce section for green sprouts without yellowed or dry edges. Like all of my recipes, these measurements are approximate and easily adjusted to your taste. My fellow Family Foodie bloggers here have converted my to coconut oil and have told me about the benefits of using this instead of my usual olive oil. Check it out here. There is a slight coconut flavor, but it melds beautifully with this dish. Thinly slice the brussels sprouts. I use my food processor for this job so it’s done in a second. Heat the coconut oil on medium high, in a deep fry pan because you are going to toss and stir and if you are like me, you will spill it all over the place. 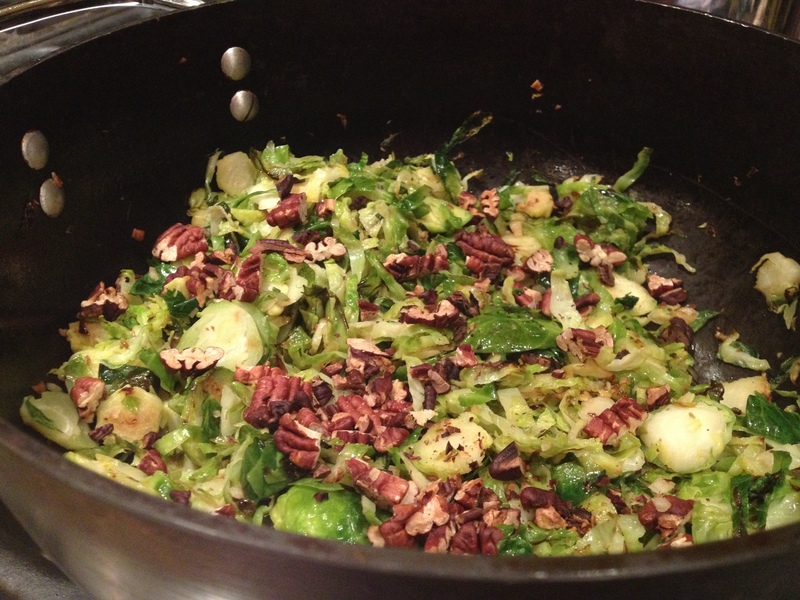 When the pan is hot, add the brussels sprouts. Sauté and brown the sprouts, they should be a bit caramelized. Meanwhile, toast the pecans and chop. Toss them into the brussels sprouts at the end. This meal is nicely finished with a piece of hearty bread.